The second generation Tadahiro (忠廣) was born Hashimoto Heishiro in Saga, Hizen in 1614. At the time of his birth, his father the first generation Tadayoshi (忠吉) was 42 years old. Tadahiro (忠廣) joined his father at the forge at the age of ten and he worked under the tutelage of not only his father but also such great smiths as the first generation Masahiro and Yoshinobu (Tadayoshi’s adopted son). When his father died in 1632, Tadahiro (忠廣) assumed leadership of the school at the young age of nineteen. In all probability, because of his young age, the Shodai Masahiro (初代正廣), who was the senior smith, effectively ran the school for a short time. Also at this time, Tadahiro (忠廣) changed his family name from Hashimoto Heishiro to Hashimoto Shinsaemon. His new name appears on a family document that was a pledge that the Hashimoto family would follow the wishes of the Shogunate and not sell swords for export to foreign countries. When studying the Tadayoshi (忠吉) School it is important to remember that the first generation Tadayoshi (忠吉) changed his name in 1624 from Tadayoshi (忠吉) to Tadahiro (忠廣). The second generation Tadahiro (忠廣), who is the subject of this paper, always signed his name Tadahiro (忠廣) and never signed it Tadayoshi (忠吉). I mention this because there was no recognized third generation Tadahiro (忠廣). The name Tadahiro (忠廣) was used by sons (such as the third generation Tadayoshi (三代忠吉) while their fathers (the current Tadayoshi (忠吉) were still alive. When their father died, the current smith using the name Tadahiro (忠廣) changed his name to Tadayoshi (忠吉) when he took over the school. 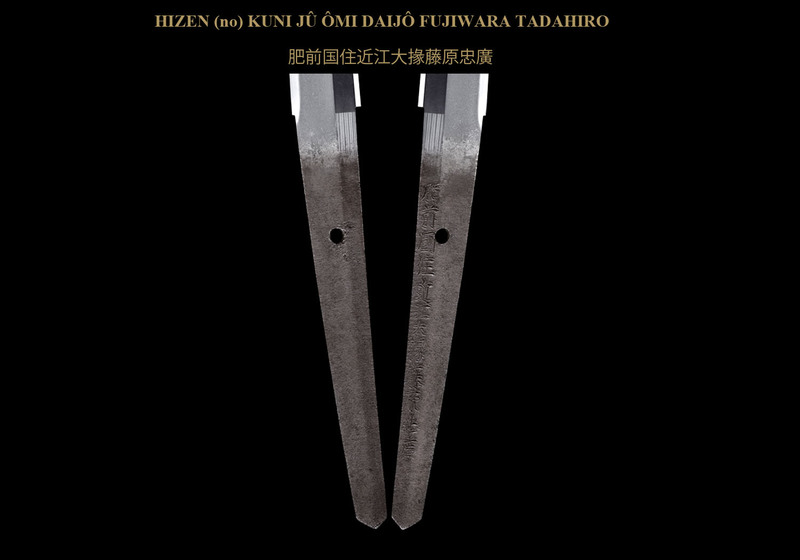 Only the second generation Tadahiro (忠廣) used the name Tadahiro (忠廣) throughout his sword-making career. Nidai Tadahiro (二代忠廣) had two sons. The first was named Hashimoto Shinsaburo who was born in 1637 and went on to inherit the Tadayoshi (忠吉) name and become the third generation Tadayoshi (三代忠吉). He was taught by his father, the Nidai, but died at a relatively young age of 50 before he was able to take over the school. 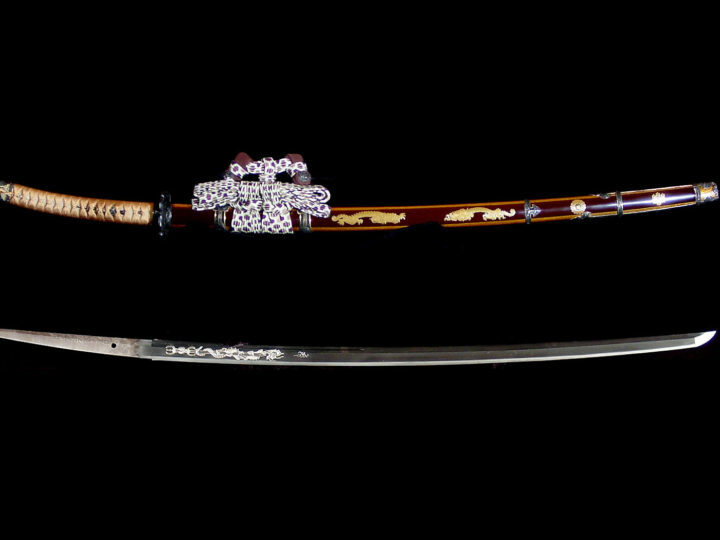 He did, however, produce some of the finest blades ever made in the Tadayoshi Kaji. His son went on to become the fourth generation Tadayoshi (四代忠吉). 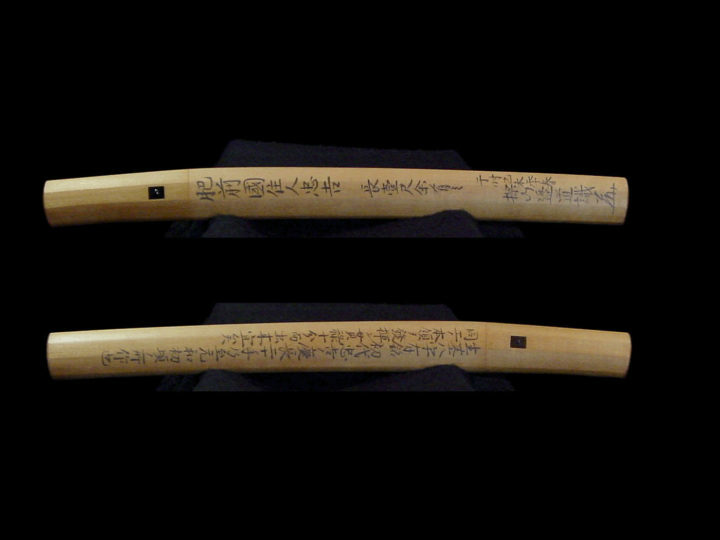 The Nidai and the Sandai made gassaku blades together, and there are many documented dai-mei and dai-saku mei Tadahiro (忠廣) blades in existence. In July of 1641 only nine years after taking over the Tadayoshi School, the Nidai Tadahiro (二代忠廣) was given the honorific title of “Omi Daijo” (近江大掾). This was a very unusual honor to receive at the young age of 28. 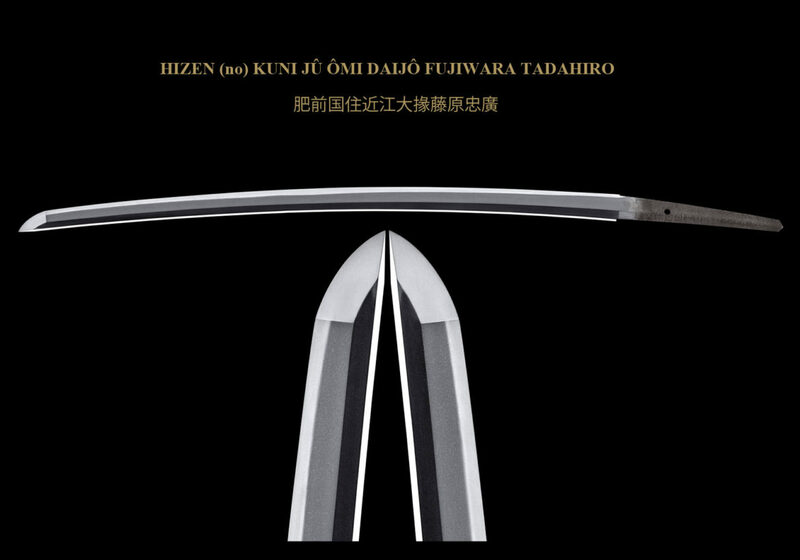 The short time to receiving this title is probably an indication of how prolific the school was in producing fine swords, and the prestige it earned for the Nabeshima Daimyo. Nidai Tadahiro (二代忠廣) passed away at the age of 81 in the sixth year of Genroku or 1693. His sword-making career spanned over sixty years and resulted in him being the most prolific artisan among the Hizen smiths. 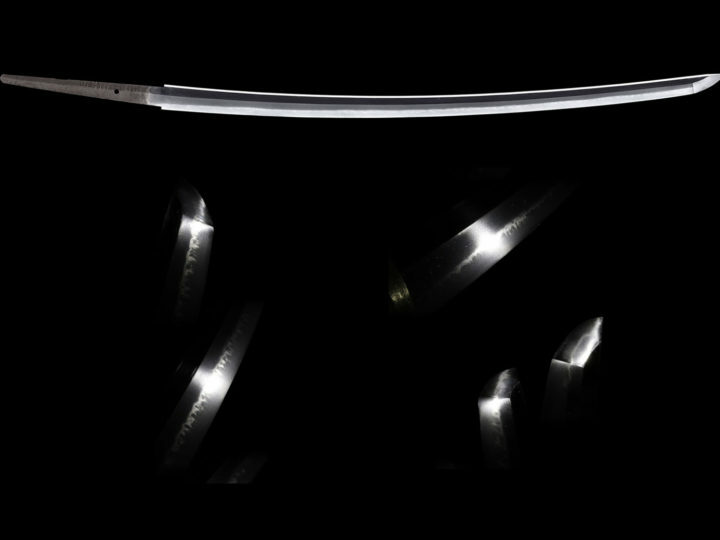 SUGATA: Katana in shinogi-zukuri are the most often found followed by shinogi-zukuri wakizashi. Hira-zukuri can be found in some wakizashi and tanto, however, tanto are rare. Only rarely will you find katakiriba-zukuri blades. Since he produced blades over such a long period of time, his works include some that are in the Keicho-Shinto style, i.e. wide with little tapering and a chu-kissaki that is somewhat extended in length. During the latter half of his career we find his works becoming narrower with a conspicuous tapering toward the point. 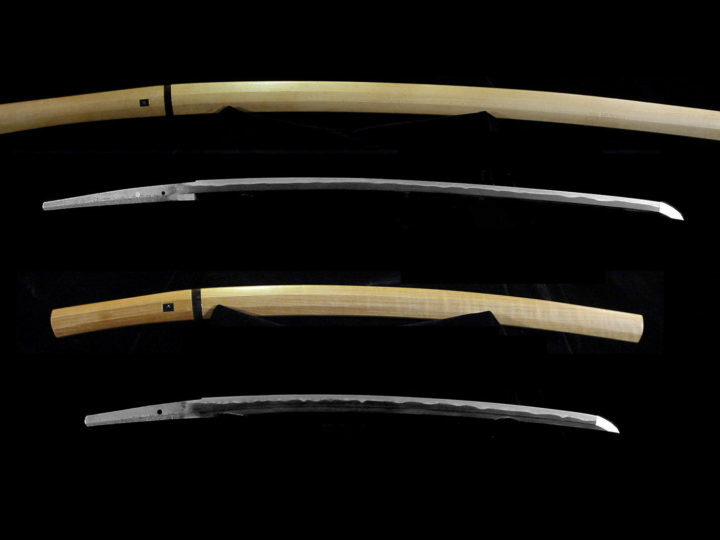 The blades made by Nidai Tadahiro blades, however, tended to be more curved and elegant than the typical Kanbun Shinto shape. JITETSU: Like the Shodai Tadayoshi, his blades have a very tight ko-itame hada known as konuka-hada that is unique to the Hizen School. Among his earlier works made before he received the “Omi Daijo” title, are included some with forceful appearance induced by relatively coarse grain structure containing many chikei. HAMON: Nidai Tadahiro’s forte is his skill in producing suguha. There are more blades with a suguha temper among his works than midareba. The Nidai’s suguha is very straight and contains no notare-gokoro that is present in the Shodai’s works. There are ko-ashi and yo. There are also some works with notches or fushi in the ha. Among his midareba works, gunome is most prevalent. Others consist of ko-notare mixed with gunome or a florid type of gunome mixed in basic choji. BÔSHI: Ko-maru made gentle. Chu-kissaki. There is some hakikake. HORIMONO: Excellent horimono can be found and was usually done by his son, Tadanaga, or his cousin, Yoshinaga. NAKAGO: The nakago-jiri is iri-yamagata. The yasurime are kiri. He left many dated works.